Baby’s Breath, Black Henbane and Giant Hogweed. No, we’re not in Harry Potter’s potion class, and we’re not casting spells. These are just some examples of the invasive plants growing along our roadsides. We’ve talked a bit about invasive plants in a previous post, but we’re adding something new to our arsenal. Signs. It may not look like much, but these signs (like the one in the picture) warn our maintenance contractors not to disturb the site until it can be dealt with properly. That can take time, depending on the type of plant, as we may have to wait until the spring or fall for the treatment to be effective. We don’t want the plant spreading in the meantime, and leaving the area alone is the best way to prevent that. A plant has gone to seed. We don’t want to disturb the site if there’s a chance these seeds could spread. The plant can reproduce from pieces of itself. 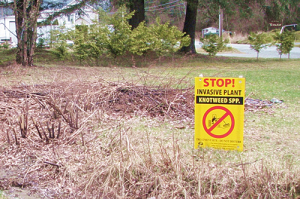 Some plants, like the invasive Knotweeds, can grow from bits of its stem or root, so typical mowing or brushing could just make things worse. There is a safety risk. Some of these plants aren’t just dangerous to the local ecosystem. Some, like Giant Hogweed, can cause people’s skin to burn and blister, so it’s best to stay away unless you’re properly equipped. An herbicide has been used. Herbicides can take time to affect the plant. If the plant is cut before the herbicide can take full effect, there’s a chance the plant could survive and spread. If you come across one of these signs, please take care. Don’t get too close and don’t disturb the soil. There’s a wealth of information about invasive plants and what we’re doing about them on our website. 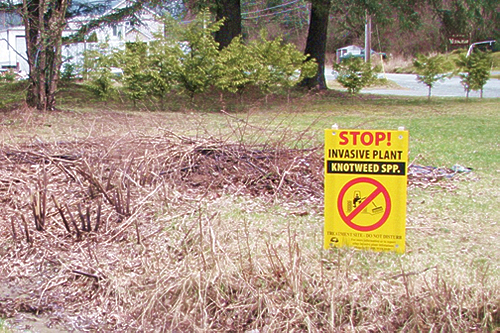 And if you want to report an invasive species growing along our roads, don’t hesitate to call 1-888-WeedsBC. You can also make a report online. The more eyes we have out there the better, and working together we can help keep these plants in check.